The Abilene Cowboys cruised to a 30-6 victory on the road at Clay Center behind the legs and hands of running back James Mayden. The 6’ 180 Senior shredded the Tigers for unofficially 314 total yards and five touchdowns in the game. He had a total of five touchdowns last year in Abilene’s 2-7 injury plagued season. The Cowboys went to Mayden early and often behind a veteran group of offense lineman. Abilene brought back four of their five starters up front, led by three year starter Kade Funston a 5’11” 250 Junior. The Cowboys also returned 6’5” 230 Senior tight end Preston Boyd, who made an impact on the first series after he missed most of the preseason with a hand injury. Boyd caught a 22 yard pass on 4th and 10 at the Tiger 28 yard line to set up Mayden’s first score. Mayden would run it in from 6 yards out to make it 6-0 with 5:24 to play in the opening quarter. He would then score on the second drive on a nine yard pass play as Mayden took the ball away from two defenders to increase the Abilene lead to 12-0. The score would remain the same going into halftime. The second half was more of the same as Mayden would score on runs of 64, 17 and 63 yards. He carried the ball 18 times for 252 yards in the game and was named the First National Bank of Hope Player of the Game. Quarterback Cooper Glavin scored Clay Center’s only touchdown with 5:47 to play in the fourth. With the victory Abilene erased memories of last year’s 48-6 home loss to the Tigers. 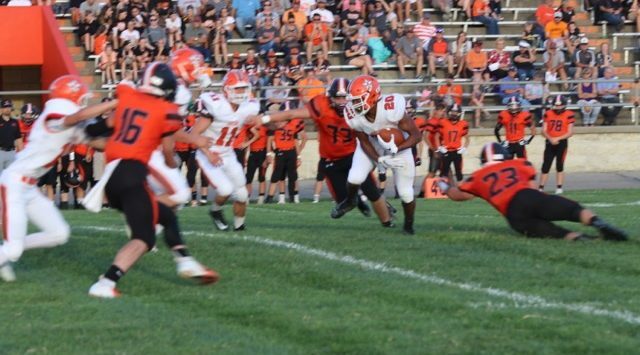 Clay Center, a Senior laden team a year ago, only brought back one returning starter on both sides of the ball and also has a new head coach this year in Ted Brown. The Cowboys unlike the Tigers brought back a wealth of experience this season and have 21 Seniors on their roster and it showed Friday night. Abilene will host Concordia next week, the Panthers fell 21-6 at home to Wamego Friday night. The Cowboys lost to the Panthers 35-18 a season ago. Clay Center will host Marysville next Friday. The Bulldogs fell at Chapman 34-18 Friday night.